Rock of the Westies, released in October 1975, is the tenth studio album release for Elton John. As with Captain Fantastic and the Brown Dirt Cowboy, Rock of the Westies debuted on the US Billboard 200 chart at No. 1, the only two albums at that time to have done so. It was less successful in the artist's home territory of the UK, where it reached No. 5 on the UK Albums Chart. Robert Christgau ranked it as No. 7 on his list of the best albums of 1975. The title is a play on the phrase "West of the Rockies", the album having been recorded at Caribou Ranch in the Rocky Mountains of Colorado. "Grow Some Funk of Your Own"/"I Feel Like a Bullet (In the Gun of Robert Ford)"
Rock of the Westies contained the US No. 1 (#14 UK) single, "Island Girl", which was released prior to the album. John noted at the time in a radio interview[which?] that he had wanted to release "Dan Dare (Pilot of the Future)" as the album's first single instead of "Island Girl", because he thought it had more commercial appeal. He was over-ruled, and "Dan Dare" was never released as a single, whilst "Island Girl" became a hit. The make-up of John's band was different on Rock of the Westies, being without his long-time drummer Nigel Olsson and bassist Dee Murray, both of whom John fired during April 1975. Added in their place were drummer Roger Pope, an old friend who had played on Empty Sky, Tumbleweed Connection and Madman Across the Water, and American bassist Kenny Passarelli, who had previously played with Stephen Stills and was an original member in Joe Walsh's band Barnstorm. Pope had also played in Kiki Dee's touring band. Grammy, Emmy, and Academy Award nominated James Newton-Howard, at the time a virtual unknown, was also brought in as keyboardist, giving him his first major publicity. Also included was Caleb Quaye, another old friend from his early DJM session days. Like Pope, Quaye had also played on Empty Sky & Tumbleweed Connection & also John's intervening eponymous release. Retained from the previous line-up were Davey Johnstone and Ray Cooper. A slower, less up-tempo version of "Hard Luck Story" had already been recorded by Kiki Dee (whom the song was originally written for), and released as a single one year prior to its recording for Rock of the Westies. Along with "Don't Go Breaking My Heart", it is credited to Ann Orson/Carte Blanche (An 'orse an' cart / 'carte blanche') a punning moniker John devised when composing a song (music and lyrics) on his own. The name Ann Orson is also used as the name of a backing vocalist. Labelle performed backing vocals on the opening track, "Medley: Yell Help/Wednesday Night/Ugly". In the US, it was certified gold in October 1975 and platinum in March 1993 by the RIAA. Outside the US and Canada, this was the last original studio release from John on DJM Records, before forming his own label, The Rocket Record Company. The song "Street Kids" was featured in the 2008 video game Grand Theft Auto IV. All songs written by Elton John and Bernie Taupin, except where noted. “Ann Orson/Carte Blanche” is a pseudonym used by John and Taupin. ^ "Elton John - Rock Of The Westies". Discogs. ^ "Rock of the Westies - Elton John | Songs, Reviews, Credits". AllMusic. ^ Lindsay Planer. "Rock of the Westies". AllMusic. Retrieved 11 January 2012. ^ Christgau, Robert (1981). "Consumer Guide '70s: J". Christgau's Record Guide: Rock Albums of the Seventies. Ticknor & Fields. ISBN 089919026X. Retrieved 27 February 2019 – via robertchristgau.com. ^ Holden, Stephen; Holden, Stephen (18 December 1975). "Rock of the Westies". ^ "Pazz & Jop 1975: Dean's List". Robert Christgau. 29 December 1975. Retrieved 11 January 2012. ^ "10 Fun Facts About 'Rock Of The Westies' and 'The Big Picture'". Elton John. ^ "GOLD AND PLATINUM ALBUMS". neosoul. Retrieved 16 October 2012. ^ Pennanen, Timo (2006). Sisältää hitin - levyt ja esittäjät Suomen musiikkilistoilla vuodesta 1972 (in Finnish) (1st ed.). Helsinki: Kustannusosakeyhtiö Otava. p. 263. ISBN 978-951-1-21053-5. ^ "InfoDisc : Tous les Albums classés par Artiste > Choisir Un Artiste Dans la Liste : Elton John" (in French). infodisc.fr. Archived from the original (PHP) on 10 September 2013. Retrieved 24 February 2012. ^ a b "Hit Parade Italia – Gli album più venduti del 1975" (in Italian). hitparadeitalia.it. Retrieved 24 February 2012. ^ "charts.org.nz Elton John – Rock of the Westies" (ASP). Hung Medien. Recording Industry Association of New Zealand. Retrieved 24 February 2012. 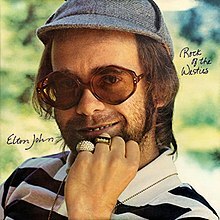 ^ "norwegiancharts.com Elton John – Rock of the Westies" (ASP). Hung Medien. VG-lista. Retrieved 24 February 2012. ^ "swedishcharts.com Elton John – Rock of the Westies" (ASP). Sverigetopplistan. Retrieved 24 February 2012. ^ "Chart Stats – Elton John – Rock of the Westies" (PHP). UK Albums Chart. Retrieved 24 February 2012. ^ "allmusic ((( Rock of the Westies > Charts & Awards > Billboard Albums )))". allmusic.com. Retrieved 24 February 2012. ^ "Album Search: Elton John – Rock of the Westies" (ASP) (in German). Media Control. Retrieved 24 February 2012. ^ "RPM Top 100 Albums of 1975". RPM. Archived from the original on 24 July 2013. Retrieved 24 February 2012. ^ "Les Albums (CD) de 1975 par InfoDisc" (in French). infodisc.fr. Archived from the original (PHP) on 11 July 2013. Retrieved 24 February 2012. ^ "RPM Top 100 Albums of 1976". RPM. Archived from the original on 24 February 2014. Retrieved 24 February 2012. ^ "Canadian album certifications – Elton John – Rock of the Westies". Music Canada. ^ "British album certifications – Elton John – Rock of the Westies". British Phonographic Industry. Select albums in the Format field. Select Gold in the Certification field. Type Rock of the Westies in the "Search BPI Awards" field and then press Enter. ^ "American album certifications – Elton John – Rock of the Westies". Recording Industry Association of America. If necessary, click Advanced, then click Format, then select Album, then click SEARCH.